The harvest is one of the central themes of history. It not only provides sustenance for a village, but economic prosperity. This scene portrays women collecting oranges in a Mediterranean orange grove. The work is arduous as basket after basket is collected from the orchards just beyond. Painted in 1890 by John William Waterhouse, it is typical of the love many artists have had for Italy over the centuries. The artist’s distinct sense of color, composition and subject is obvious. The muted palette makes the scene look as arduous as the work was in the orchards. The little girl in the foreground is a symbol that everyone in the village was called upon to help during harvest time. 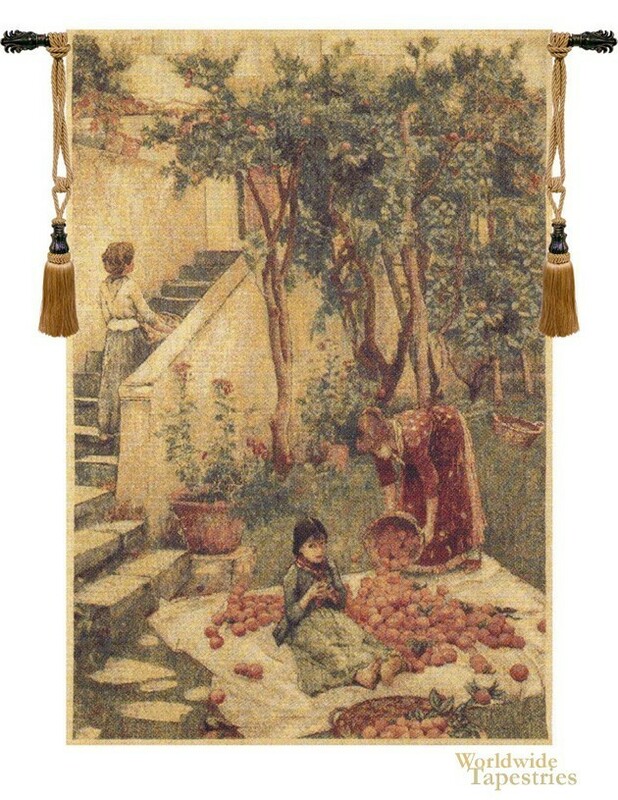 This tapestry is unlined and has a tunnel for easy hanging. Note: tapestry rod and tassels, where pictured, are purchased separately.